I know. I know. A lot of you will read this and say "triple doubles don't make you MVP", and you know what, that's absolutely correct. A bunch of triple doubles does not make you the MVP by far. A lot of you who have posters of LeBron on your wall will say "LeBron deserves the MVP every year, every season" and you're incorrect. LeBron is always a top tier MVP candidate. Sometimes he deserves it, and sometimes he doesn't. Get over it. The last two seasons for LeBron have been very good, but there's usually someone in the regular season doing more extraordinary or just as extraordinary things without nearly as much help as LeBron has. 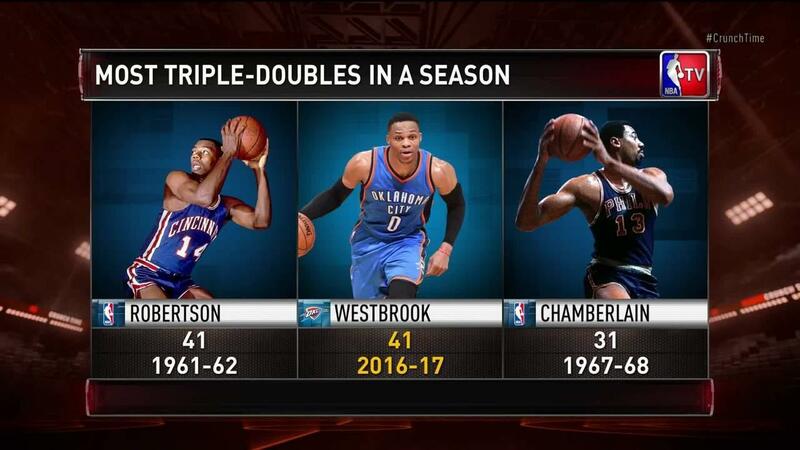 This season, individually, no one is having a better season than Russell Westbrook. At the moment, he's sitting at a record setting 41 triple doubles, tied for the most ever in NBA history in a season. Now, for many, this means a lot, as it's been 55 years since the last time we've seen someone put up this many triple doubles or anything even close to it. Russ is a different kind of athlete. He's like a tank, a machine that's played in all 78 games this year and shows no signs of fatigue or slowing down. It's amazing. Where a few other MVP candidates have missed a game or two, played through a tough injury and lost, or just rested a few games because they "earned it", Russ has no intention of doing so even as the season is basically over. That takes nothing away from what anyone else this season . Russ should be resting for the playoffs shouldn't he? Nope. He doesn't need to. This is what makes his incredible feats even more exciting and special. There is the argument against Russ of course that his team doesn't have enough wins, but it's not necessarily as big of a factor as it usually would be. There are exceptions to the rule in NBA history, but rarely. Rarely. Rare. Like averaging a triple double. Like being the no. 1 for your team and still facilitating and running the entire offense to put up 41 triple doubles. That's going to be the talking point of any Russ for MVP conversation and it's not a bad talking point like some want to say. The fact remains, Russ is making history and you have to award history. He's leading a team that without him would be lost. We are here today to kick off our three part series of the "EOTR Case For MVP", and we have to start with the proverbial front runner in Russell Westbrook. Let's get into it. James Harden fans and apologists not withstanding, I think his team is better than Russ and the Thunder. Let me explain. Harden has naturally better players around him, sixth man of the year candidates, and some very solid shooters (which is vital to surviving in this game). Because of this, he would naturally have the better record or that would be expected. I know, some of us didn't expect Houston to be a third seed, but to be honest, that was more of me hoping they didn't than my actual expectations. The Thunder went 55-27 last season with a fully healthy KD and Westbrook to earn the third seed. This year, with all their ups and downs, they're 45-33 and could finish the season somewhere between 47-35 and 49-33 depending on these last few games. The odds have been stacked against them it seemed however though. A down year for Steven Adams, a Victor Oladipo who is inconsistent and was unhealthy during a stretch, as well as a two month period without Enes Kanter were really tough moments for the team and they managed to persevere during that tough stretch. After a few trades, which could have messed up the flow of the team, they picked things back up. I think we expected Russ to ball out this year, but he is having one of the greatest individual seasons I've ever witnessed ever. Not just because he's averaging a triple double, but it's because of what he adds and the role he has for his team. He's the most valuable player this year period. Don't believe me? I'll let Matt and Peagle tell you why. Peagle- Russell Westbrook is the MVP. Hands down, stop arguing, SHUT. THE HELL. UP. People whine about how the MVP became about who had the best season and not who's most valuable to their team? Cool. 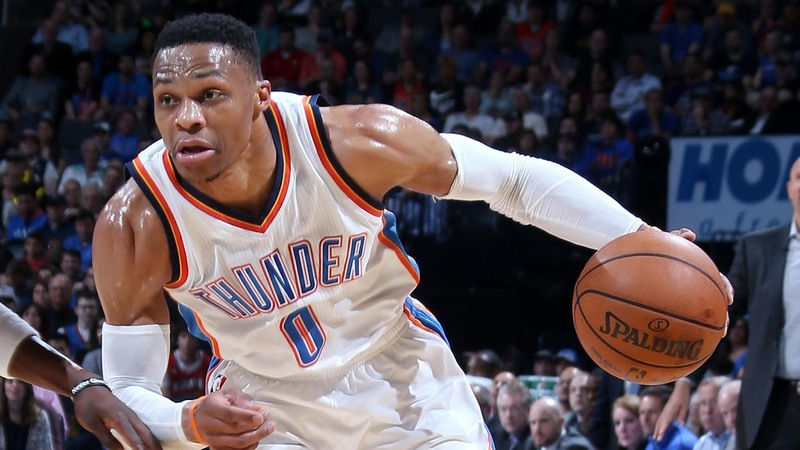 Russ is having the best statistical season (Check), and look at the Thunder roster. That's a 20 win team without him. (Check). I'm not gonna dump on anyone else to prop Russ up, because Harden is showing the hell out, but there are things about that Rockets team I cannot ignore (Sixth Man of the Year winners/candidates). The man is AVERAGING a triple double. Something that I'd wager that everyone reading this has never seen, only heard about. Give props, pay homage and most important of all, give that man that trophy. TrueBlueLowry21- Westbrook is my choice for MVP for a few good reasons.If we're going off the standard meaning of the award then Westbrook is without a doubt it. Yes, we can state that he has over 40 triple doubles, but there's something that others don't seem to grasp. 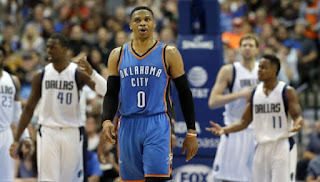 If we took Westbrook off that OKC team then the Thunder without a doubt would be nowhere near a playoff spot. They're currently 6th in the playoffs, and you can say without Westbrook, the Thunder are likely the worst in the Western Conference.... maybe 3rd worst at best. Russ is valuable to his team because, let's face it, that's basically their only chance to do anything offensively. Westbrook is the MVP based off of how valuable he is to his team. It's hard to really pinpoint his 5 best games this year and this season, when his team is 32-9 when he records a triple double, and his career high in points came in a loss to Portland. He's had some great games in losing efforts as well and some amazing victories this year. Here's the 5 games that I feel are his best this season to help his case for MVP. -Statiscially speaking and percentage wise, this wasn't his best game by far, but it was something that I hadn't witnessed personally before and to do so in just the 2nd game of the season, it let you know the type of season Russ would have. 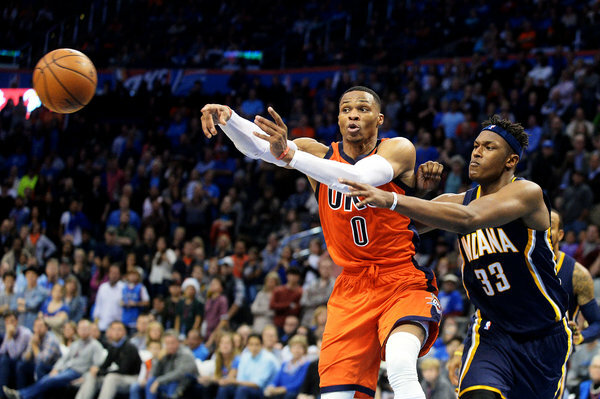 The Suns are a tough team when they want to be and for Russ to put the team on his back and lead them to victory here was something very important for the direction of the Thunder. Russ was still getting the rust off from missing months in the offseason, but he looked like a machine on a mission in this game. We should have known that was just the beginning in a 51 point, 13 rebound, and 10 assist night. -I chose this game because it showcased that Russ was growing in his game. 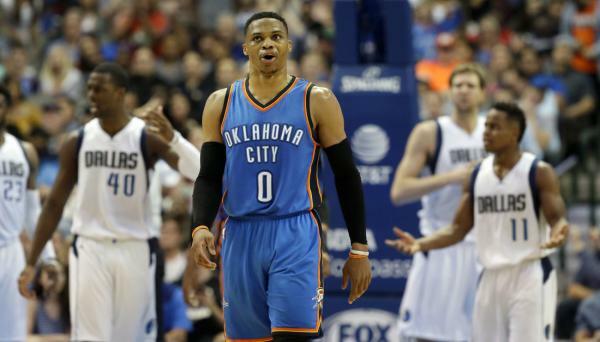 Despite a slightly underwhelming shooting night from the field, Russ was 15 for 17 from the free throw line and 3 for 4 from three. He managed to pace the floor and lead the offense, and any game where you can dish out 17 assists and lead your team to a victory is a big game. 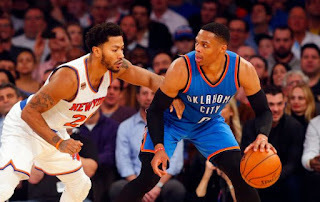 This remains one of the games where Russ didn't necessarily have shot falling, but he found a way to get to the line, score, and dish out assists to the guys who were hot from the field that night. 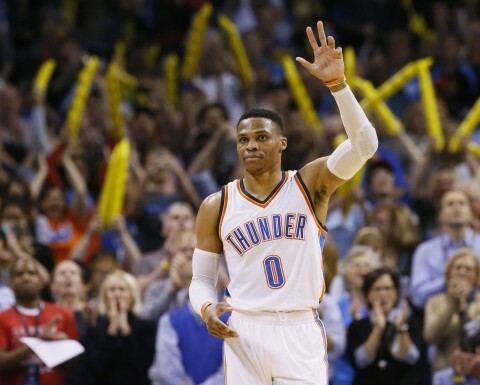 This is an all around complete game for Russ and while some may criticize it, I really enjoyed it. -The Celtics are a top team in the East. For Russ to go in and have the kind of night that he did, it showcased exactly the level of athlete that Russ is. 45 points on 53% from the field and 71% from three with 88% shooting from the free throw line. Russ was truly on a roll here and he led his team the best that he could against a possible contender in the East. 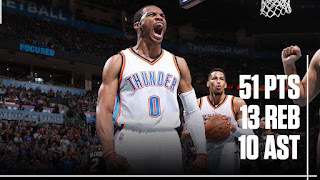 This is what makes me put this one on the list over some of his games against the Raptors, Knicks, Houston, Cleveland (which was a great win) and more, because this was a true showing of Russ and his leadership in crunch time when he was needed. -Simple as this. 57 points. 11 aasists. 13 rebounds. In a comeback victory over the Magic. Many have called this the "MVP statement" triple double and in a way, it really was. However, I prefer the Memphis game he had a few games later not because it was a better shooting night, but because he did it against one of the toughest defenses in the league and an actual playoff team on the road. 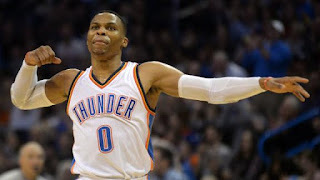 Here he was on the road against a weaker Orlando team and it seemed like the Thunder were all but done until Russ took over and helped bring them back in the game and finish with the highest amount of points ever in a triple double, the second 50 point triple double for him this season, and the 3rd 50 point game on the season for him. Russ is really something amazing to watch and this is one of those games you have to see to believe. -I just watched this game once more to make sure it was as amazing as I thought it was. It's the last game he played so far as of this writing and it's one of the most interesting games and probably the best game for Russ of the season overall (next to his win at Boston). With 45 points on 56% shooting and 61% from three, along with 9 rebounds, 10 assists, and 5 steals, Russ had one of the most efficient nights in his career. He hit a dagger three pointer to close the game out with about 17 seconds left to go. 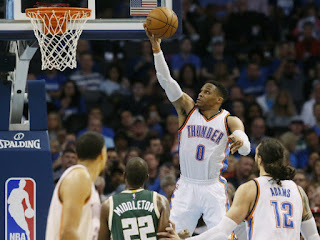 If there's a game you look to when deciding the MVP, this is the Westbrook game you should show them. That speaks volumes because it is NOT ONE of his 41 triple doubles and this might be his best night. Amazing honestly. Russ is putting on a show for all of us this season and though some think he isn't deserving of the award, he is. We could go into more detailed stats, but we leave that for NBA Twitter and those who dissect numbers just to prove their point. What matters just as much as the numbers, is how you lead your team and to me, there is no better leader this season than Russell Westbrook. He doesn't have two sixth man of the year candidates on his team and a Mike D'Antoni structured offense. He doesn't have two All Stars with a very solid bench. He doesn't have a 20 year system that hasn't failed on his side either. 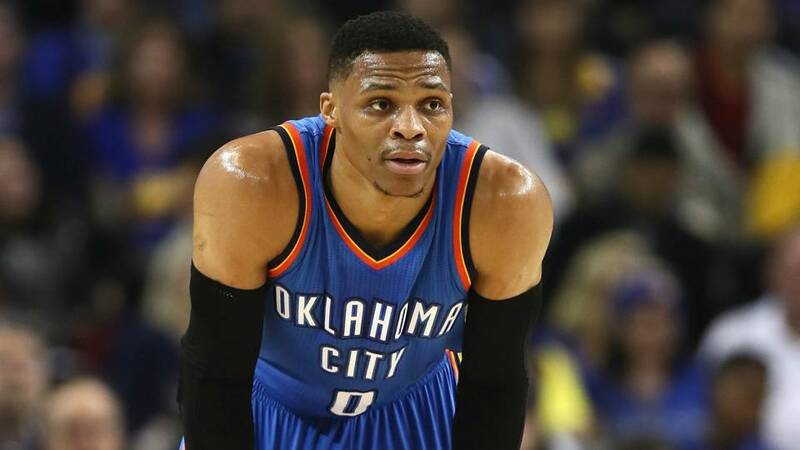 He lost the 2nd best player in the NBA and a former MVP and instead of adjusting and falling off tremendously, the Thunder are only about 6 or 7 games overall below what their record was last year (they could finish at 49-33, just 6 games below of what they did last year). 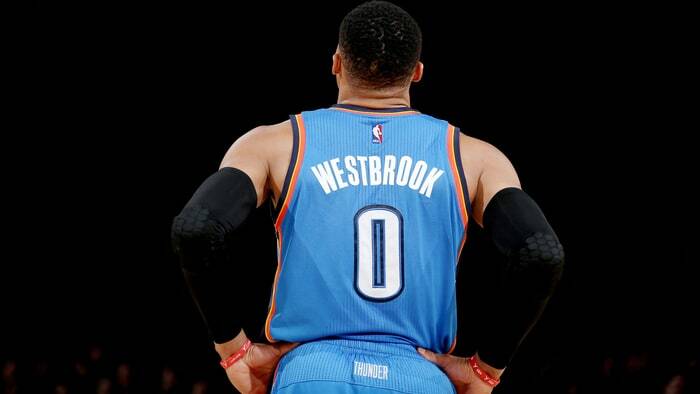 The fact remains, Russ has done more with less and for that reason, in addition to those 41 triple doubles and averaging 31.8 points, (leading the league), 10.7 rebounds, and 10.4 assists a game, which is something we never thought we would witness. Simply put, there is no player more valuable to their team this season than Russ, and there is no one that is having a better individual season either. 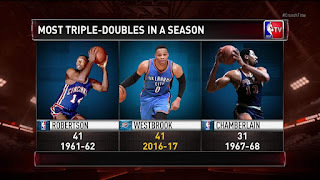 I love how the narrative now is to downplay how vital those triple doubles have been because it is Russ who is doing them. I wonder if it was someone like KD, LeBron, or even Harden with 41 of them and averaging one how the narrative would be different. 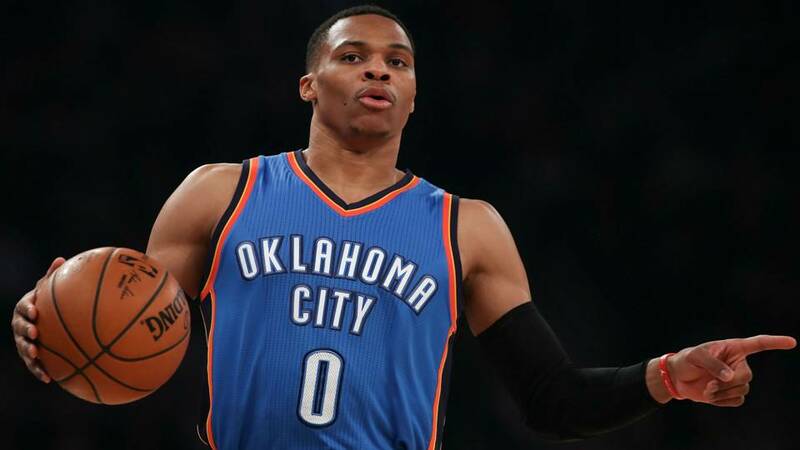 Regardless, if I had to make a pick for MVP, with all due respect to the amazing season that James Harden is having, my top choice is Russell Westbrook. However, don't fret Harden fans, part two of this Case for MVP series will look at his season and his case for the award. 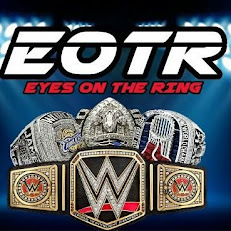 We here at EOTR and DAR Sports believe in being objective about sports and fair. Something that a majority of ESPN personalities don't. However, I'll say it again: Russ for MVP.